Jerry Spinelli can be counted to write heartfelt stories about good kids and their simple lives. Third Grade Angels, the prequel to Fourth Grade Rats, is no exception. This easy novel follows the adventures of Suds and his friends in their quest to earn halos from their teacher, Mrs. Simms. While the premise is light, the novel brings up the question of if a child should do what is right, even if no one is watching. Ever the teacher, I am excited to see integrity being discussed in such a simple and relatable way. Speaking of teachers, I have to applaud Spinelli for always creating realistic educators in his books. Mrs. Simms is the third grade teacher that everyone deserves. 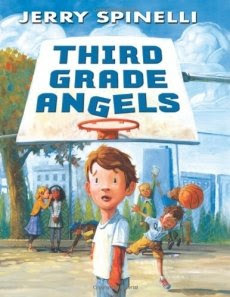 Third Grade Angels is a timeless story and could have been written thirty years ago, but for a few modern additions like Suds and his mom fist-bumping, and the new kid referring to a classmate as a “hottie”. These almost felt anachronistic in the story, but will be appreciated by young readers. Although my sixth graders wouldn’t be caught reading a book with “third grade” in the title, I will be handing this book to my friend who teaches elementary school. I know her kids will gobble it up!